Computer Graphics International 2019 will be held from June 17th through June 20th 2019 in Calgary, Canada. SIGGRAPH Asia Technical Brief, 7:1-7:4, 2018. ACM Transactions on Graphics, Volume 37, Issue 4 (Proc. of SIGGRAPH2018), Article 98, August 2018. The Visual Computer (Proc. of Computer Graphics International 2018). Code and demo site for Automatic Colorization. Demo site for Neural Network-based Sketch Simplification. MVA2017 was successfully held at Nagoya University, Nagoya, Japan from May 8th through 12th, 2017. "Higher-Order Graph Cuts and Medical Image Segmentation" (invited talk) Mathematical and Computational Methods in Biomedical Imaging and Image Analysis (MCBMIIA2015), Nov. 24, 2015. University of Auckland, New Zealand. MVA2015 has been successfully concluded. It had 257 participants from 32 countries. I will also be the general chair of the next one: MVA2017, which will be held in Nagoya. In the 25th European Conference on Operational Research (EURO2012), Jul. 8-11, 2012, Vilnius, Lithuania. Our stereo illusion was chosen as one of the TOP 10 finalists in the 2009 Best Visual Illusion of the Year Contest. ACM Transactions on Graphics, Volume 37, Issue 1, Article 11, January 2018. ACM Transactions on Graphics, Volume 36, Issue 4 (Proc. of SIGGRAPH2017), Article 107, July 2017. 30th IEEE Conference on Computer Vision and Pattern Recognition (CVPR2017), Honolulu, Hawaii. July 22-25, pp 5768-5776, 2017. 23rd International Conference on Pattern Recognition (ICPR2016), Cancun, Mexico. December 4-8, 2016. ACM Transactions on Graphics, Volume 35, Issue 4 (Proc. of SIGGRAPH2016), Article 110, July 2016. Winner, the Innovative Technologies 2016 Special Award for Culture by the Ministry of Economy, Trade and Industry. ACM Transactions on Graphics, Volume 35, Issue 4 (Proc. of SIGGRAPH2016), Article 121, July 2016. 29th IEEE Conference on Computer Vision and Pattern Recognition (CVPR2016), Las Vegas, Nevada. June 26-July 1, pp 298-307, 2016. Data-Dependent Higher-Order Clique Selection for Artery-Vein Segmentation by Energy Minimization. Yoshiro Kitamura, Yuanzhong Li, Wataru Ito, and Hiroshi Ishikawa. International Journal of Computer Vision, Volume 117, Issue 2, pp 142-158, April 2016. Psoas Major Muscle Segmentation Using Higher-Order Shape Prior. Tsutomu Inoue, Yoshiro Kitamura, Yuanzhong Li, Wataru Ito, and Hiroshi Ishikawa. MICCAI Workshop on Medical Computer Vision: Algorithms for Big Data (MICCAI-MCV 2015), LNCS9601, pp. 116-124, 2015. A HOG-Based Hand Gesture Recognition System on a Mobile Device. Lukas Prasuhn, Yuji Oyamada, Yoshihiko Mochizuki, and Hiroshi Ishikawa. IEEE International Conference on Image Processing (ICIP2014), Paris, France, Oct 27-30, 2014. Coronary Lumen and Plaque Segmentation from CTA Using Higher-Order Shape Prior. Yoshiro Kitamura, Yuanzhong Li, Wataru Ito, and Hiroshi Ishikawa. The 17th International Conference on Medical Image Computing and Computer Assisted Intervention (MICCAI2014), Boston, Massachusetts, Sep 14-18, 2014. 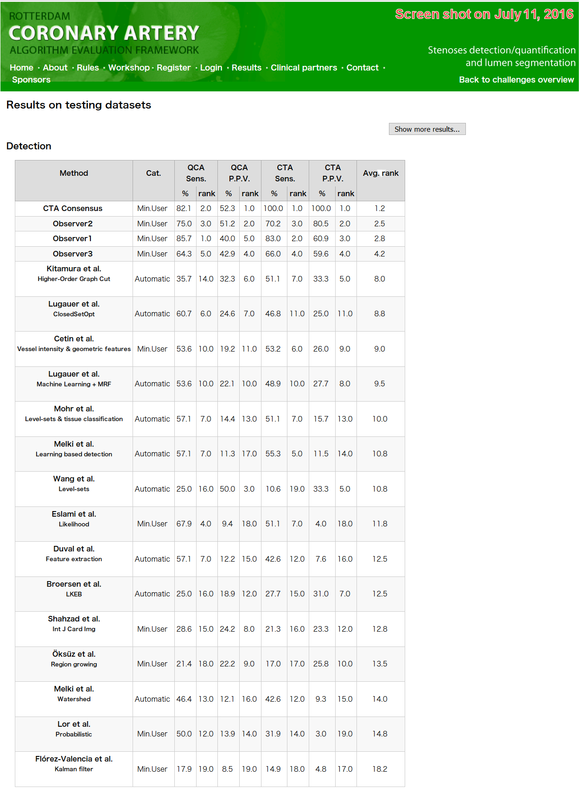 The algorithm described in the paper, a coronary artery stenoses detection and lumen segmentation algorithm using higher-order graph cuts, is now listed at the top in the Rotterdam Coronary Artery Stenoses Detection and Quantification Evaluation Framework website (as of July 4, 2015)(screen shot on July 11, 2016)). IEEE Computer Society Conference on Computer Vision and Pattern Recognition (CVPR2014), Columbus, Ohio. June 23-28, 2014. pp. 1362-1369. In the Fifth International Workshop on Pulmonary Image Analysis, MICCAI2013, September 26, 2013, Nagoya, Japan. In the Twelfth European Conference on Computer Vision (ECCV2012), October 7-13, 2012, Firenze, Italy. Lecture Notes in Computer Science 7577, pp. 400-413, Springer-Verlag. Graph CutsCombinatorial Optimization in Vision (Chapter 2). Hiroshi Ishikawa. In Image Processing and Analysis with Graphs: Theory and Practice, Edited by Olivier Lézoray and Leo Grady, CRC Press, July 2012. ISBN: 978-1-439-855072. Optimizing Multi-Label MRFs with Convex and Truncated Convex Priors (Chapter 4), Hiroshi Ishikawa and Olga Veksler. In Markov Random Fields for Vision and Image Processing, Edited by Andrew Blake, Pushmeet Kohli, and Carsten Rother, MIT Press, September 2011. ISBN: 978-0-262-01577-6. IEEE Transactions on Pattern Analysis and Machine Intelligence, vol. 33, no. 6, pp. 1234-1249, June 2011. (Published online in March 2010). Copyright 2011 IEEE. Twelfth IEEE International Conference on Computer Vision (ICCV2009), Kyoto, Japan. September 29-October 2, 2009. pp. 568-574. Copyright 2009 IEEE. IEEE Computer Society Conference on Computer Vision and Pattern Recognition (CVPR2009), Miami Beach, Florida. June 20-25, 2009. pp. 2993-3000. Copyright 2009 IEEE. arXiv:0711.4508. Revised June 12, 2008. Slides for the talk given at INRIA. Eighth Asian Conference on Computer Vision (ACCV 2007), November 18-22, 2007, Tokyo, Japan. Lecture Notes in Computer Science 4844, pp. 537-548, Springer-Verlag. Ninth European Conference on Computer Vision (ECCV 2006), May 7-13, 2006, Graz, Austria. Lecture Notes in Computer Science 3953, pp. 526-537, Springer-Verlag. Vision Research, Vol. 46, Issues 1-2, pp. 171-178, January 2006. Tenth IEEE International Conference on Computer Vision (ICCV 2005), October 15-21, 2005, Beijing, China. pp. 1132-1139. Copyright 2005 IEEE. Higher-dimensional Segmentation by Minimum-cut Algorithm. Hiroshi Ishikawa and Davi Geiger. 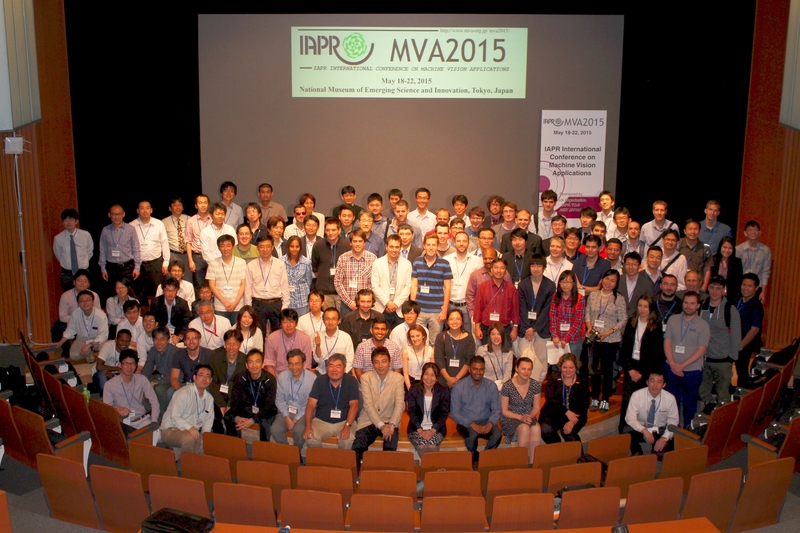 PDF Ninth IAPR Conference on Machine Vision Applications (MVA 2005), May 16-18, 2005, Tsukuba, Japan. IEEE Transactions on Pattern Analysis and Machine Intelligence, Vol. 25, No. 10, pp. 1333-1336. October 2003. Copyright 2003 IEEE. IEEE Transactions on Pattern Analysis and Machine Intelligence, Vol. 23, No. 10, pp. 1075-1088. October 2001. Copyright 2001 IEEE. Eighth IEEE International Conference on Computer Vision (ICCV'01), July 9-12, 2001, Vancouver, Canada. Copyright 2001 IEEE. Ph.D. Dissertation. May 2000, New York University. Seventh IEEE International Conference on Computer Vision (ICCV'99), September 20-27, 1999, Kerkyra, Greece. Copyright 1999 IEEE. IEEE Computer Society Conference on Computer Vision and Pattern Recognition (CVPR'99), June 1999, Fort Collins, Colorado. Copyright 1999 IEEE. IEEE-EURASIP Workshop on Nonlinear Signal and Image Processing (NSIP'99) 20-23 June 1999, Antalya, Turkey. Copyright 1999 IEEE. IEEE Computer Society Conference on Computer Vision and Pattern Recognition (CVPR'98), June 1998, Santa Barbara, CA. Copyright 1998 IEEE. Fifth European Conference on Computer Vision (ECCV '98), June 2-6, 1998, Freiburg, Germany. Lecture Notes in Computer Science 1406, pp. 232-248, Springer-Verlag.